Why didn’t the helihome ever catch on? I spent a few hours last week at the RV Museum and Hall of Fame in Elkhart, Indiana, where curator and RV historian Al Hesselbart was kind enough to give me a personal tour of the collection and share some of his RV stories and photos. I’ll be including some of the photos in my Well Mannered Traveler column on msnbc.com this week, along with tips on RV etiquette, but wanted to share a few of my favorites right away. 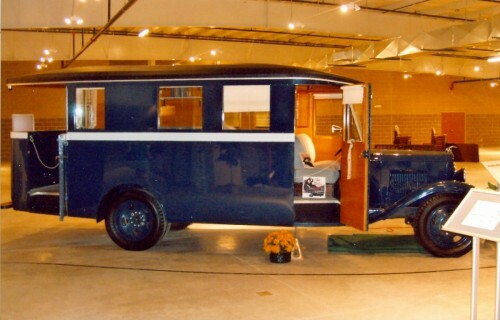 The first is this 1931 Chevrolet Housecar, which was owned by Mae West. Hesselbart is confident West never really camped out in this house on wheels, but rather used this chauffeur-driven model in much the same way modern-day actors use trailers on the set. And check out this 1976 Heli-home, a helicopter camper – with canopy – that could sleep six. If you had one of these, you’d have little chance of getting stuck at the airport on your way to your next camping vacation.